American DJ Ikon LED DJParts - All Variety of Parts that DJ Needs. The Ikon LED is a high output single Gobo Projector powered by a bright 60W (7500K) white LED. This fixture used high quality optics for crisp, clear projection. User can adjust the LED brightness and Gobo rotation on the rear of fixture or by the included wireless RF remote control. The Ikon LED includes 4 metal Gobos. Users may also insert custom Gobos in the fixture. 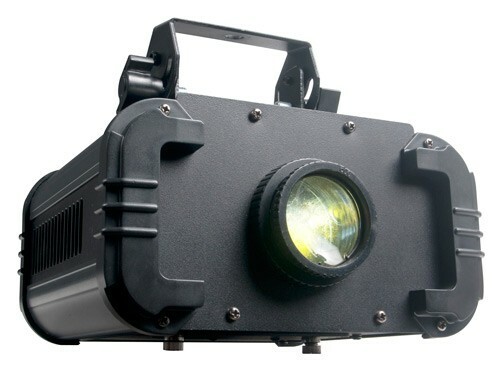 This projector also comes with three interchangeable lenses that produce different beam angles (25, 32 or 43 degrees) making it versatile for a wide variety of applications. Specifications: • Bright white 60W LED indoor Gobo Projector • High quality optics - Clear powerful output • Adjustable dimmer and rotate knob on rear panel • Includes 4 replaceable metal Gobo patterns • Gobo size: 54mm; Viewable size: 33mm • Run all night – No Duty Cycle • Easy Gobo replacement access • Manual focus • Ideal for Mobile DJs, Clubs, Bars, Retail Stores and Promotional Events • Very low heat output • Beam Angle: 25, 32 or 43 degrees (Includes 3 different lenses) • Long life LED (Rated at approximately 50,000 hrs.) • IEC AC outlet on side to daisy chain power (up to 4 Ikon LED’s @ 120V and 7 Ikon LED’s @ 230V) • Color Temperature: 7500K • Includes yoke to mount on a wall or hang from trussing • Includes RF Wireless Remote • Multi-voltage: 100-240V, 50/60Hz • Power consumption: 83.6W max • Dimensions (LxWxH): 9.5” x 8” x 8.5”/ 236 x 227 x 215mm • Weight: 8 lbs. / 3.6 kg.